As we enter the Christmas (oh excuse me "Holiday") season, most of us end up going to the Post Office way too often to mail out gifts or cards (or in my case, eBay auctions). So I thought that this postcard was appropriate. 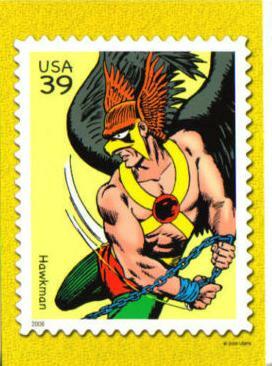 Image: Hawkman postcard, 2006, Murphy Anderson, image obtained from eBay. Things have been pretty crazy at El Casa Del Jacone the last week. I moved to a new position at work and thus did not have my computer all week. This was coupled with getting a new HVAC unit installed at the house, plus Turkey Day, Black Friday, Xmas decorating and watching the Panthers blow it -- it's a wonder I am here at all. I am going to try to get back on track with some posts for all of my loyal readers out there, so keep watching this space. Thanks and I hope everyone had a good American Thanksgiving holiday! The month rolls on, and the stream of Hawk related stuff continues as well. Brightest Day #14 -- Apparently, the previous issue was the one I was waiting for, but of course that was the first one which I had ordered through DCBS. Hopefully I will have both it and this issue in my hands shortly. I am not sure when exactly they ship their books. But you folks will be... among the first to know! DC Universe Legacies #7 -- This issue, which deals with the death of Superman and the breaking of Batman, could theoretically feature the Volume 3 take on Katar Hol, although I wouldn't hold my breath. 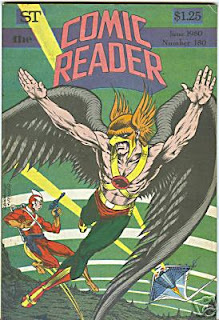 I have never read an issue of Comic Reader, although I have occasionally seen an issue here or there in a back issue bin. If I ever come across this issue, I'll buy it just for the cover. We have a very Silver Age style cover with the Winged Wonder and Adam Strange being pursued by an alien vessel. Definitely brings back memories of the adventures those two, along with their super-hot and super-tough wives, had back in the day. Makes me nostalgic! Image: Comic Reader #180, 1980, ????. This image, provided to yours truly by the always resourceful Shag, is from Superboy #1, written by Jeff Lemire and with art by Pier Gallo. On the last page of the issue we get these teaser images, including that Thanagarian looking chum in the bottom panel. 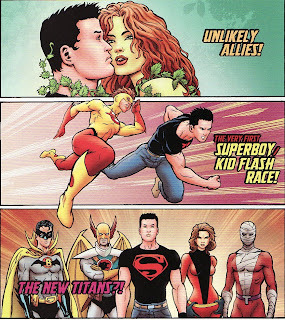 According to an interview with Lemire over at The Superman Homepage, the character is named Hawklad and is part of a group named (as is evident here) The New Titans. And as for the mysterious "New Titans" I won't tell you what their story is yet, but the characters are as follows: Hawklad, Negative Lad, Elongated-Lass and The Bat-Man. Oh and one of them is Tim Drake! Who is Hawklad? Hawkman was never represented in the Teen Titans traditionally (and no, Golden Eagle doesn't count) because Hawkgirl held the dual position of love interest and sidekick. But with the seeming re-emergence of Thanagar in titles as varied as Rann-Thanagar War (and Holy War), World of New Krypton, and Brightest Day, now seems as good a time as any to introduce a young Thanagarian Wingman to adventure on Earth. Of course, I doubt it will be that easy, but should be fun reading if nothing else. Image: Teaser page from Superboy #1, 2010, Pier Gallo. Summary: One year after the opening salvo of the Shadow War, the Thanagarians continue to play their quiet invasion of Earth. Meanwhile, Hawkman and Hawkwoman are frustrated with their lack of progress thanks to their detector not being able to give them enough notice to stop incoming Thanagarians from hiding out amongst humanity. As they ponder this, the alarm goes off. The two heroes suit up, blowing off a meeting with Midway City Museum press secretary Joe Tracy to investigate a landing at the Justice Center. They arrive at the Center to find Captain Frazier and his team already there. The prisoners have managed to seize control of the building and black it out, plus shoot down a police helicopter from the roof. The Hawks spring into action, dropping gas bombs on the roof. But when they land, they find no escapees, only the Shadow-Thief! The Thief mocks the Winged Wonders, and tells tham that his employers want to make them an offer -- rejoin the Thanagarians! Hawkman is having nothing of it, but Shadow-Thief has a new trick up his sleeve, as he is able to control his tangibility by thought! He then brings the escaped prisoners onto the roof from the Thanagarian Distortion Field he was controlling. Thief makes a fast getaway while the Hawks mop up the prisoners. The next day at the museum, Carter and Shiera's office is bust into by Joe Tracy, along his fellow employee Coral. Tracy raves at the two curators and makes veiled threats before storming off. Coral explains that Joe is back on the bottle, and that he has been a wreck since the death of Mavis Trent, whom he harbored a secret love for. She promises to calm him down, but she is lying; we see that Coral is a Thanagarian agent who has been enabling Joe's drinking. 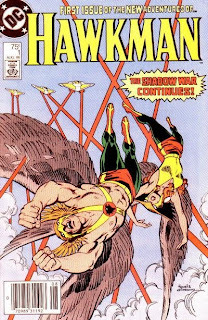 The confrontation with Joe inspires Carter to reinvestigate the previous landing sites, and this time the Hawks come across a hood ornament from the "Hyathis Corporation" -- the name of the entity which brought so much despair to Thanagar. Glad to find a new angle, they have no idea what awaits them -- for the Thanagarians are busy rigging the upcoming Presidential election, while Joe Tracy has published an expose revealing the true identities of Hawkman and Hawkwoman! Review: The new series begins much the way Shadow War ended, which is appropriate, given as it's the same creative team for the most part. It's definitely got that mid-80s style, sort of a modernized take on the classic setup. It's interesting to see how Isabella was revamping the Hawks in a very subtle sort of way now that we have the luxury of being able to look ahead at what Truman and Ostrander would do a few years down the road. Still, I enjoyed this issue and it made me very eager to see how the various plots would play out. Plus, I dig Howell's rendition of the Shadow-Thief, always a favorite of mine. The last page shocker took me totally by surprise! 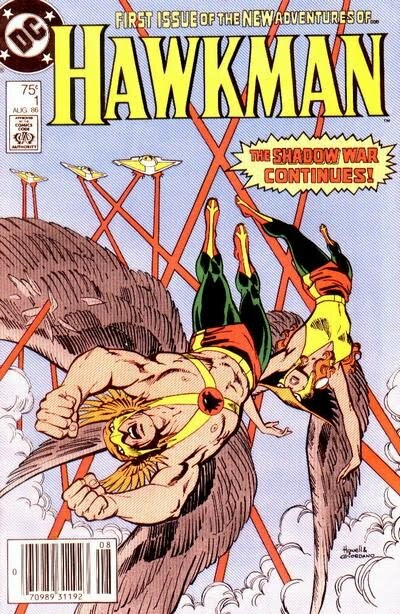 Image: Hawkman v.2:no.1, 1986, Richard Howell. We have only one item with actual Hawkstuff in it this week, so we're also going to take a look at some other items from around the DC Universe. JLA Deluxe Edition v.4 HC -- This hardcover collection of Grant Morrison's time on JLA includes a big blowout battle against the Injustice League as well as a throwdown with the Crime Syndikate. 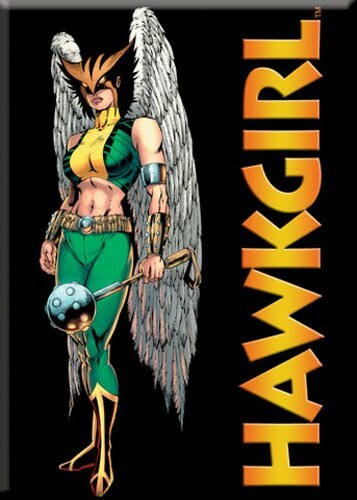 Hawkgirl figures into this collection, and if you squint you can see her on the cover as well. All-New Batman: The Brave And The Bold #1 -- I've read an issue here and there of the earlier version of this series, and it's great fun, just like the TV show. Not sure why they relaunched it, but if the quality remains the same DC should have a contestant winner here. Ame-Comi Steel PVC Figure -- At first I thought this was going to be a meka'd out version of John Henry Irons, but alas, it's his niece. Which makes more sense, but man, a Super Robot-esque (because I don't think they would make him Real Robot style) Steel would be pretty sweet! JLA Classified Zoom -- REVERSE FLASH IN THE HOUSE! As promised, here is the Hawkgirl magnet from the Brightest Day magnet set by Ata-boy. Much like the Hawkman magnet is not a depiction of the Hawkman from Brightest Day, this Hawkgirl magnet is clearly the previous incarnation of the character, Kendra Saunders. Still, I am not going to complain about Hawkgirl merchandise, especially a nicely designed little magnet like this. I'm seriously considering ordering this set to help build up the "cool fridge magnets" for my son when he gets older. This image looks like Ivan Reis to me... anyone out there have any thoughts? Thanks to Shag (who bears the Honor Wings), we have a look at the Hawkman magnet from Ata-boy! I wasn't sure if you'd seen these new magnets from ata-boy. 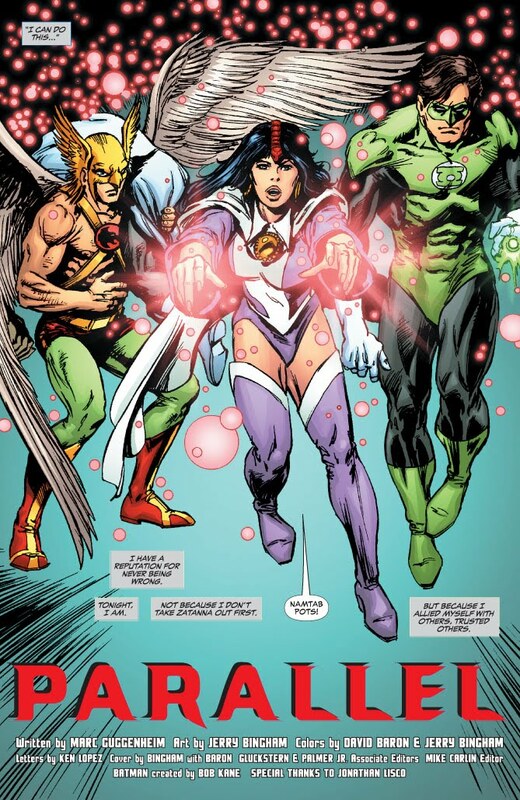 They were solicited as a Brightest Day magnet set, but in several cases they used old costumes. I picked up the Firestorm magnet at my local comic shop. Well, it's not exactly a Brightest Day rendition of Hawkman, but a Murphy Anderson (I think...) Hawkman magnet is still a worthwhile investment in my book. I like the very traditional, classic Silver Age look the Winged Wonder is sporting here. I mean, look at the build, the slim wings, and the chain mace. Ladies and gentlemen, this is Katar Hol right here! 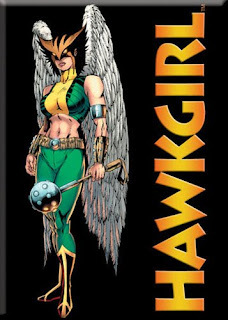 Come back later and get a peek at the Hawkgirl magnet from the same set! Hawkman, along with the rest of the Satellite era Justice League, crops up in the oversized Batman Confidential #50, which is in stores now. The issue features artwork by Jerry Bingham, who handled the art chores on Son Of The Demon waaay back in the day. The hype piece from The Source suggests that Hawkman will at least make some appearances for the next few issues as well. Might be worth checking out in collected form, if for nothing else than seeing the Winged Wonder looking very spiffy! Image: Page from Batman Confidential #50, 2010, Jerry Bingham. So, when everyone else besides me heads down to the LCS today, will they find anything new in the way of Hawk-related stuff? Let's look and see! Brightest Day #13 -- Between the cover and the preview (as we saw yesterday) this issue catches back up with Hawkman and Hawkgirl in Hawkworld. Rumors abound on how the events of Brightest Day are going to somehow combine the Earth and Thanagarian Hawk-mythos into one. Which isn't that far fetched when you consider that Carter Hall was reborn on Thanagar, in Katar Hol's body, and Volume 4 featured several Thanagarian elements. Still, is there a logical way to mix the two? Speculation abounds, although I think the revelation from Blackest Night (supported in Brightest Day) that life began on Earth (and ostensibly spread, including to Thanagar) may have something to do with it. One I have concocted -- that Khufu and Chayera are not the trapped souls, that they themselves were reincarnated from older, Thanagarian lovers. Does it work? Who knows? And who cares! Right now I am just enjoying the ride! Thanks to DC's Source blog, we have a preview of Brightest Day #13, featuring the Winged Wonders! 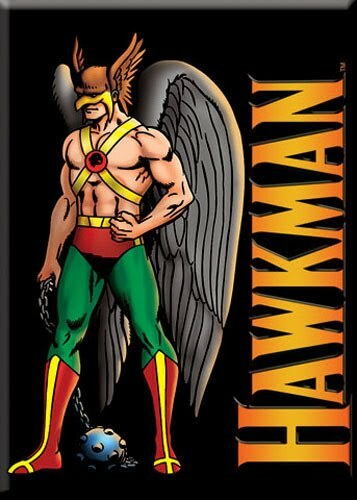 High above the clouds of the Nth City on Hawkworld, Hawkman takes center stage, as he begins an all-out assault to save his beloved. But back on Earth, who will the White Lantern ring choose as its bearer and, in turn, the protector of the planet? The last page will shock you. All in an issue's work from the all-pro team of Geoff Johns, Peter Tomasi, Ardian Syaf, Ivan Reis and Joe Prado. BRIGHTEST DAY #13 arrives tomorrow. Looks awesome! Unfortunately, I am going to have to wait to read it! D'oh! Oh, and evidently the cover featuring the Hawks is not the variant cover, but the standard. Sweet! Image" Brightest Day #13, 2010, David Finch. Well, we reported to you a few weeks ago that James Robinson made a slip-up regarding Hawkman at NYCC, and the rumor mill that he is working on a Hawkbook after Brightest Day has gained a lot of steam. Now we can attached a rumored artist to the rumored series -- Phillip Tan, currently the artist and co-plotter (with Dan DiDio) over on Outsiders. You'll recall that back in March at Emerald City Comic-Con, Tan offered up for sale a print of Hawkman... perhaps this was a sign of things to come? I still don't like the super-busy helmet design, but I generally have dug his work on Outsiders and wouldn't mind seeing him take a crack at the Winged Wonders. Of course, this is all speculation and hearsay, unless it is revealed to be true, at which point I will claim to have had inside information!